As winter marches towards spring, I peer out my backyard window watching the steady stream of snowflakes cap the array of lobster pot buoys I have strung across a fence and hung from a small tree seemingly burdened by the weight of them all. These renegade buoys have been collected from the many gunkholes and beaches I have visited aboard my 19-foot O’Day Mariner that has been in my family since before man last walked on the moon. “My backyard” – that’s an abstract term for a boater. My backyard stretches from the Hudson River to Block Island, encompassing all of Long Island Sound and beyond. Even though I do not live on the water, a piece of me does. In reality, like most people, I live several miles inland, but to any boater our backyards are almost infinite. My vessel died at sea, water seepage, delamination and finally taking on too much water for the bilge pump to handle, it was time. I literally ran my boat to its death. A good way to go I thought, in its own element. The burial, not so much. I donated the boat to charity. Three guys from Ohio showed up two days late with the wrong kind of trailer. As half-wit, dim-wit and nit-wit pondered their quandary, I could not bear the thought of my cracked hull laying on the interstate. So, with the paperwork signed over I left them to their own devices. As I drove away with one eye on the road and a teary eye in the rearview mirror I thought that some sort of industrial strength chipper, for cremation, might have been a better way to go. So with the love I have for the water and the daily appreciation I have for it, when that inevitable day came and I found myself off the water, I thought I would be better prepared for it. All things considered I was, for that day at least. It was the ensuing days that hit me like a rogue wave. What I failed to realize is how boating becomes so much a part of your life. It’s like I lost my best friend. It’s not just a hobby, it’s a culture and a way of life. It seeps into all facets of your world. Nautical terms just surface into everyday language. From stow that away to hit the head, the mindset is inescapable. If like most boaters, you are not lucky enough to live on the water, you will find the water in a boater’s home. Photos of and from your boat, nautical paintings, coffee mugs, welcome mats and how many issues of this and other magazines are in the head. Try Christmas – there were probably nautical presents sitting under those nautical Christmas tree ornaments. Take it outside, there’s probably something of nautical heritage in your backyard and then there are the lobster pot buoys. 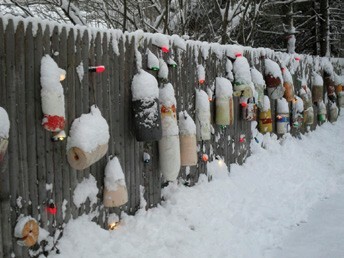 Come on, what boater doesn’t have at least one, there like badges in your yard? Boating also brings your world outside more than most. Weather reports have more meaning and your own sense of the weather is heightened. Even in the Northeast, boating is a year-round thing, from putting her to bed in the fall to getting ready to launch in the spring. Then there are the mid-winter trips to the boatyard after snowstorms, to check things out. Once there, the snowballs thrown at the white shrink-wrap dissolve as much as your mind dissolves into thoughts of summer. As for the upcoming summer, I have only two thoughts. First, “my backyard” is now measured in square feet, not miles. Second, the beckoning call of a sunrise glistening off my wake on a glass calm morning, or a sunset lighting up just the tops of the waves, says that life on the water should not be left astern of me! Richard C. Ilse lives in Stamford, CT.